As I reflect on these words from the Litany of Consecration for recent graduating classes, I am reminded of both the privilege and responsibility of alumni to nurture and strengthen the Eagle Queen and to keep the Tougaloo tradition alive. 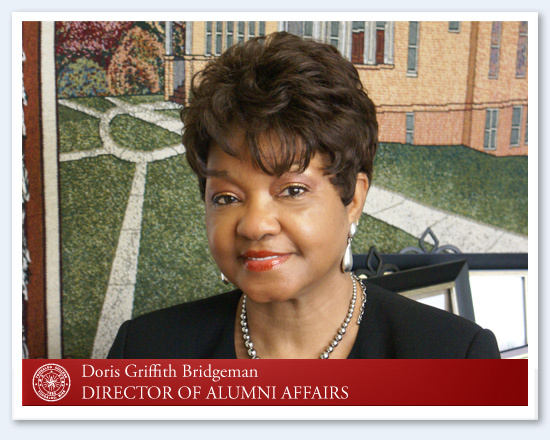 The Office of Alumni Affairs is honored to accept the challenge to serve as intermediary between the College and alumni through the Office of Institutional Advancement and to work diligently with the National Alumni Association. The staff is ready and willing to serve in partnership with our Tougaloo family to maintain the integrity of the Tougaloo College legacy. I encourage and challenge all of us to reflect intentionally on what Tougaloo College has meant, means now, and will forever mean to us personally and as a unified body. When we reminisce about our experiences and fond memories, recognize that what we have gained from these experiences, friendships, and fellowship, was what brought us to where we are now; successful in whatever we were purposed, we will realize that we are obligated to give our work, our wisdom and our wealth back to Tougaloo because of what it has given to us. Therefore, we must recommit ourselves to share our positive testimonies to recruit students, reclaim alumni and former students, to provide whatever financial resources we can, and to give our time, talents, and energy to help enhance the lives of everyone that we touch for the Eagle Queen. Our office is here to serve you and to encourage your assistance as we strive to uphold the legacy of this great institution. For in times like these, we must all work together for the benefit of everyone.